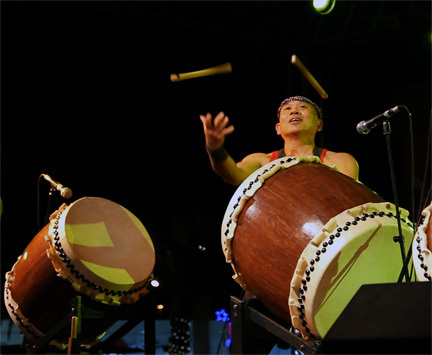 One World Taiko presents a contemporary style of Japanese drumming that incorporates dynamic and fluid movement as well as heart pounding percussion. 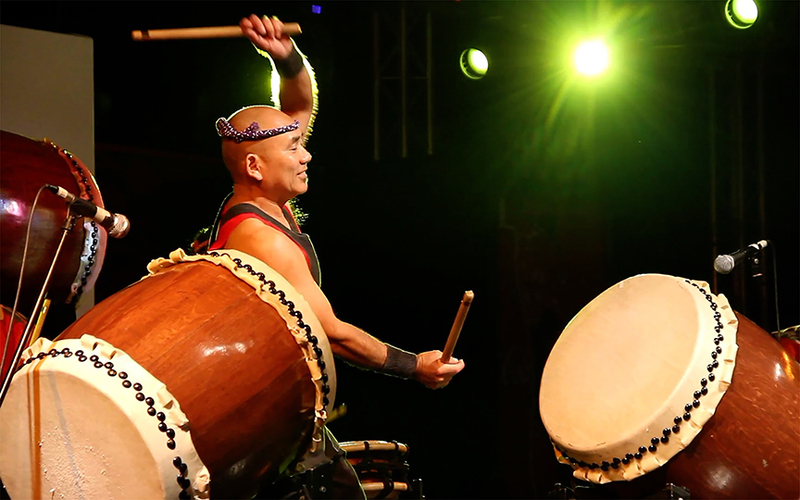 One World Taiko's music is drawn from Japan's lively festival drumming taught to them by Seiichi Tanaka of the San Francisco Taiko Dojo and their own creative rhythms, arrangements and choreography, showcased in their live performances. 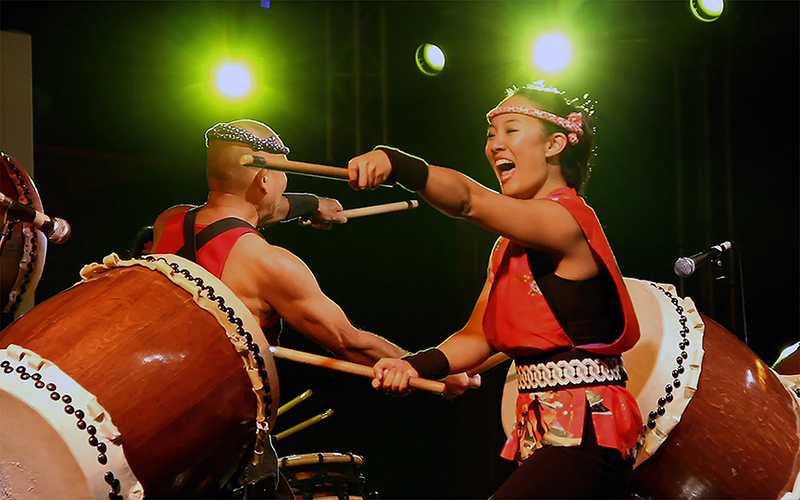 Their repertoire includes taiko pieces from Japan, and their own original compositions that feature a blend of traditional, contemporary, and world music stylings. They perform on traditional Japanese drums such as odaiko (large), chudaiko (medium), shimedaiko (small, rope-tied drum) and incorporate the shinobue (bamboo flute) and various Japanese percussion instruments. 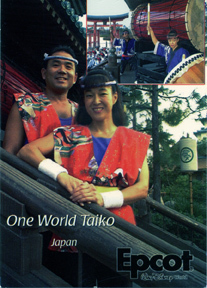 One World Taiko, founded in 1990 in San Francisco, California, is led by founding members Gary Tsujimoto and Nancy Ozaki. Gary was a founding member and former artistic director and lead drummer for San Jose Taiko. Gary also performed with the professional Japanese group, Ondekoza, as a guest artist during their USA tour in 1986. 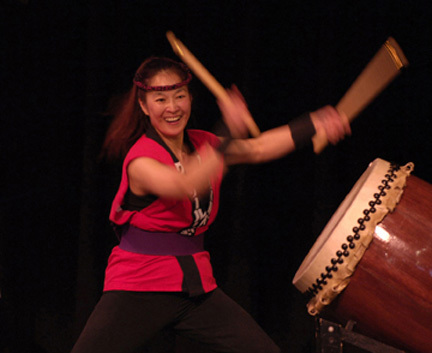 Nancy began her taiko career as a member of Denver Taiko and performed as a member with Ondekoza during their tours of Japan, Europe and the USA in 1987. One World Taiko has performed full time at the Epcot Center's Japan Pavilion at Walt Disney World in Orlando, Florida for 4 years, at Boston's First Night Celebration for the 2000 Millennium, the International Taiko Festival in Berkeley, CA, San Francisco’s Cherry Blossom Festival, the Project to Cure Paralysis in Miami, FL, the Sun and Stars Festival of Japanese Arts in Dallas, TX, the Colorado Performing Arts Festival in Denver, CO, the Grand Opening of the Exploris Museum in Raleigh, NC and numerous other venues throughout the United States and Japan. they also have performed at several large corporate events such as the McCaw Hall Opera House grand opening, Seattle's Main Library grand opening, the Jackson Hole Film Festival Opening Gala in Jackson Hole, WY, Healing Journeys in Greenville, SC, the Sony Corporation’s Annual Awards Convention in Las Vegas, NV, the National Council on Education in Ceramic Arts Convention, Janus Funds Holiday Party in Denver, CO, the Midwest US-Japan Association Annual Convention in Omaha, NE, the Kawasaki Motors Corporation USA Holiday Party in Lincoln, NE and the Genetech Corporation Holiday Party in San Francisco, CA. 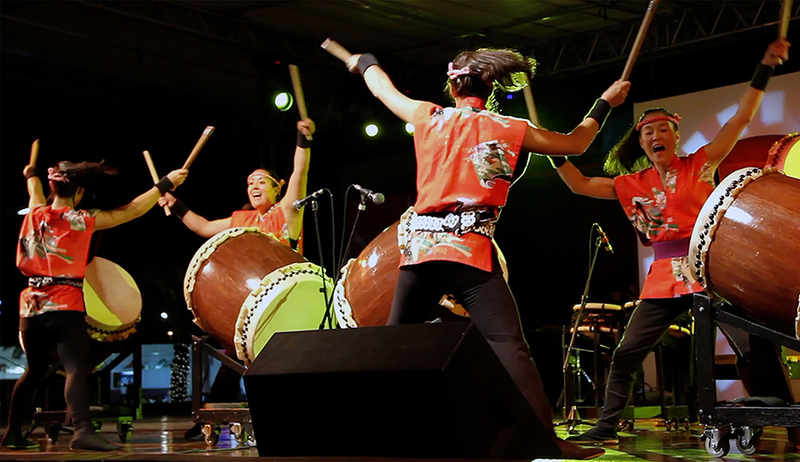 Internationally, One World Taiko has performed in Japan and also in Dubai, United Arab Emirates. They had a 5 week engagement in Dubai. It was a great experience as we met many people from the Middle East, Asia and Africa. You may have seen One World Taiko performing regularly in different parts of the country at one time or another. From 1990 to mid 1993, we were located in San Francisco, California. From mid 1993 to mid 1997, we were living in Orlando, Florida and performing at Walt Disney World's Epcot Center. From mid 1997 to mid 2001 we were based in Denver, Colorado. From mid 2001 to late 2014, we were based in Seattle, Washington. We now have a summer base in Denver, Colorado while on our national tour. at Walt Disney World in Orlando, Florida.